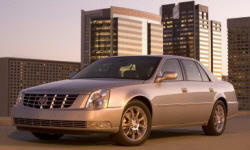 Cadillac DTS Feature Availability Pros and Cons | Page 1 of 1 | Why Not This Car? 4 Speed Automatic..... The platform (which includes the Lucerne) really needs to have a 5 speed.